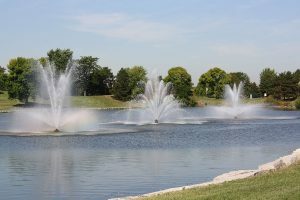 Century Park Arboretum is the District’s largest park, comprising a neighborhood, community and linear park on two parcels of land north of Route 60, between Butterfield Road and Lakeview Parkway. The entire park encompasses 113 acres of land and water. 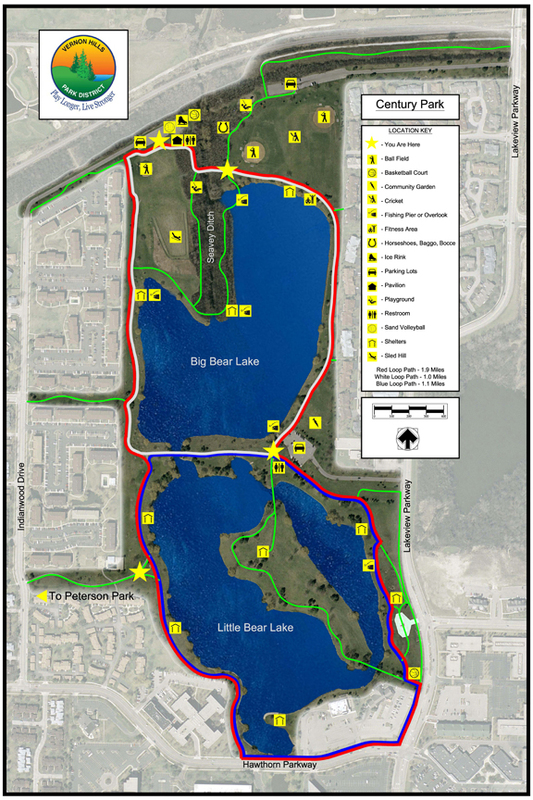 Century Park surrounds New Century Town subdivisions along Big & Little Bear Lakes. Although there are several entrances to the park, most of the park can be accessed right off of Lakeview Parkway, north of Route 60. The Park’s 113 acres, 54 of which are water, were provided by the New Century Town Annexation Agreement. In 1976, Urban Investment and Development Company developed two parcels of land prior to being deed to the District. These parcels included Little Bear Lake and the six acres on Hawthorn Parkway. Development included the tennis courts, bicycle paths, softball field, two bridges, security lighting, miscellaneous site furnishings and landscaping. These improvements, completed by Urban Investment prior to deeding the land, would have cost the District more than $250,000 at that time. In 1980, a contractor donated 60,000 cubic yards of non-organic fill to form the base of the sled hill at Big Bear Lake. The sled hill was completed in 1982, with donated time and materials from Lake County Grading and Urban Investment. In 1982, Urban Investment initiated the development of land along Big Bear Lake by finishing the grading and seeding of the land, and by building the bicycle path system. The District, using some of its own funds along with an additional cash donation from Urban Investment, was able to develop a Century Park playground. 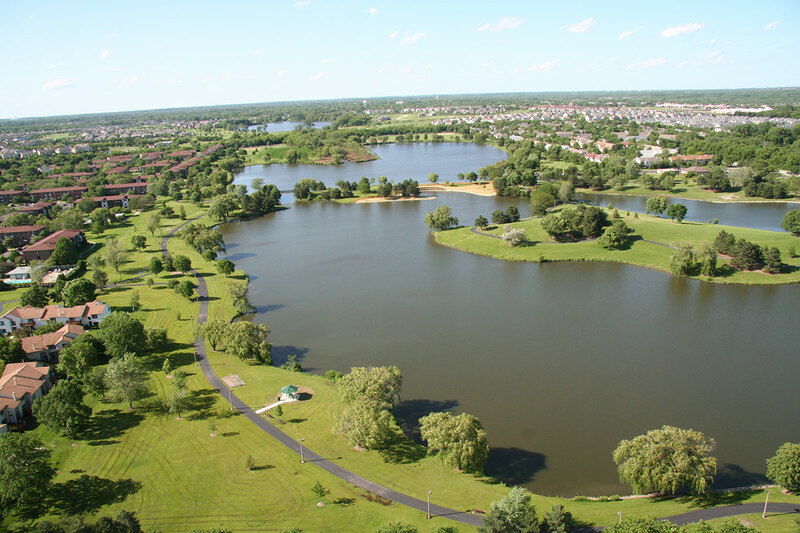 Development continued as the District added two softball fields, access roads and parking lots, boat docks and a boat launch in 1986, using a $200,000 grant from Illinois Open Space and Land Acquisition Development funds. In 1987, the Boat Rental facility at Little Bear Lake officially opened to the public. 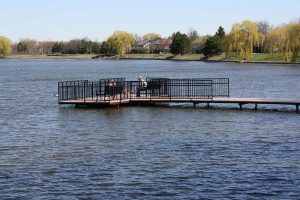 The District no longer rents boats but non-motorized and boats with electronic motors are permitted on the lakes. Many upgrades and improvements to the park have since been implemented as part of the District’s Master Plan that included a goal to upgrade all parks over the past 5 years. In the summer of 1999, Century Park received new playground equipment at two locations, while the ball field and soccer field in the Hawthorn portion were rejuvenated. Also in 1999, the exercise circuit located along the park path was replaced. A volleyball court was added in 2000 and, as part of a major capital improvement project, the three main bridges were replaced in January 2004. The District received a $400,000 OSLAD Grant in 2009 to partially fund the renovation of the north end of Century Park. The project was competed in July, 2011. 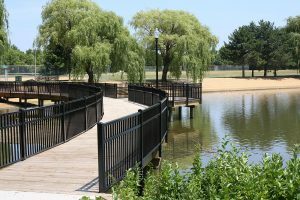 New amenities included bocce, baggo and horseshoe courts; cricket pitch, play equipment; dugout roofs, fencing and backstops for existing ball fields; 3-triactive fitness stations; picnic shelter; 2 fishing overlooks; fishing deck and pier; blue bird and duck house boxes; additional walking paths; and a 2000 square foot pavilion. In 2017, Century Park became Illinois’ first Park District park to earn Arboretum Accreditation. Hours of operation are 8:00 a.m. to dusk. 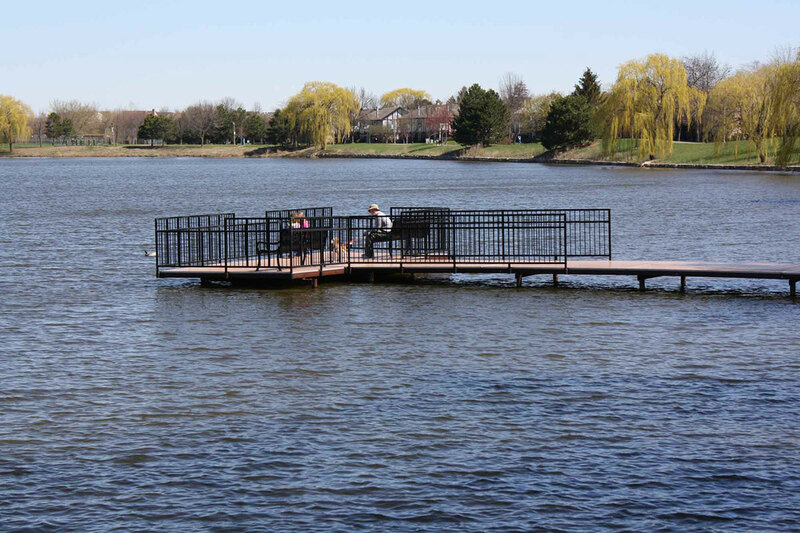 There is a boat launch ramp located at the south Lakeview Parkway entrance. Boats with electric trolling motors are permitted. The nearest drinking fountain and restrooms are located next to the south Lakeview Parkway parking lot.Big Bear Lake – 24.9 acres, deepest point is 20′ in the channel (Seavey Ditch) which runs through the lake. There are three access points by vehicle, with parking available; two off Lakeview Parkway (from the north, take Gregg’s Parkway to Lakeview and go south, and from the south, take Route 60 or Hawthorn Parkway to Lakeview, then go north) and one at the north end of Indianwood Drive (take Hawthorn Parkway to Indianwood Drive). There are multiple access points by bike or by foot, from all directions surrounding the lake. There is a child’s playground with ball fields located adjacent to the north Lakeview Parkway parking lot. There is a ball field and a basketball court located adjacent to the Indianwood Drive entrance parking lot. Little Bear Lake – 25.2 acres, deepest point is 20′ in the channel (Seavey Ditch) which runs through the lake. There are two access points by vehicle, with parking available; one off Lakeview Parkway (same directions as for Big Bear Lake above), and one off Hawthorn Parkway. There are multiple access points by bike or by foot, from all directions surrounding the lake. The nearest drinking fountain and restrooms are located next to the south Lakeview Parkway entrance parking lot, as well as a children’s playground, basketball court and volleyball court.